ESPOO, Finland, December 5, 2012 (ENS) – A new technology developed in Finland is enabling the plastic packaging industry to shift toward bio-based products, away from dependence on plastics made from petroleum. 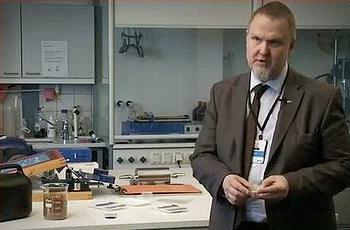 The VTT Technical Research Centre of Finland has developed a new technique to improve the quality of bio-based plastic packaging, the project’s lead research scientist announced Tuesday. With VTT’s technology, bio-based plastic packages will outperform traditional packaging materials not just ecologically but also in terms of quality. 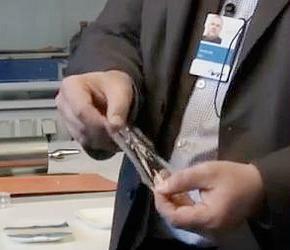 The key element is PGA polymer, says professor Ali Harlin from VTT’s biotechnology and food research laboratory. Harlin has developed a technique that enables the production of the PGA monomer glycolic acid from bio-based materials more efficiently than ever before. Made from sugar, PGA plastic has excellent barrier properties, Harlin says. As a film, it is the most efficient oxygen barrier known, and it will effectively keep food from spoiling, which is what happens to food in the presence of oxygen. In addition to strength and heat resistance, plastic packaging also needs to be airtight, vapor-proof and grease-resistant. Adding PGA into the structure of traditional plastic packaging significantly improves these qualities, says Harlin. When PGA film is used to package food, it keeps the oxygen out of the package, creating what Harlin calls a “modified atmosphere package.” There is a protective atmosphere inside the package and the oxygen is outside where it cannot damage the food. The new generation of bio-based plastic packaging is not only eco-friendly but also has several superior qualities compared to conventional plastic packaging. PGA plastic is between 20 and 30 percent stronger than PLA – the most popular biodegradable plastic on the market – and able to withstand temperatures 20 degrees Celsius higher, Harlin explains. It also breaks down more quickly than PLA, but its biodegradability can be regulated if necessary, Harlin said. Sugar-based plastic food trays are recyclable and Harlin says the trays and films can be broken down into their raw material, sugar, again. “Next generation food packages are just one step away from entering the market,” says Harlin. When that happens, he says, it will help control waste and also help conserve oil. The volume of oil used every year in the production of plastics equates to approximately five percent of the world’s total oil consumption. Approximately 40 percent of all plastics are used in packaging, which puts special pressure on the packaging industry to reduce its dependence on oil. Ethical consumption principles and legislative changes are steering the packaging industry towards sustainable development. At the moment, bio-based plastic accounts for approximately one percent of global plastic production. According to lifecycle analyses, carbon dioxide emissions from bio-based plastics can be as much as 70 percent lower than from oil-based plastics, says VTT, a state-owned research institute operating under Finland’s Ministry of Employment and the Economy. Using the new VTT technology, the plastic packaging industry is moving towards completely bio-based products and is beginning to provide the products that will allow the food packaging industry to become less and less dependent on oil. The use of renewable natural resources in industrial applications reduces dependence on oil and the carbon footprint attributable to consumption, so the shift to bio-based plastic will help the European Union meet its goal for 2050 – to reduce greenhouse gas emissions by at least 80 percent from the level of 1990. VTT specialists who have assessed Finland’s chances of achieving the 80 percent greenhouse gas emission reduction targets say the goal is a tough one for Finland, but it is possible to achieve as long as all sectors that produce or consume energy take part.